While thinking of ‘yoga’ probably doesn’t bring to mind a bunch of kids at daycare holding the downward dog position peacefully and quietly, you’d be surprised at the benefits of teaching kids yoga at daycare. Okay, okay…we don’t expect the young little active ‘monkeys’ to hold their positions for 5 minutes at a time, or lay still for 10 minutes not moving or talking. That’s not what children’s yoga is about. Reading the articles written by some teachers of children’s yoga, you’ll see that the primary lesson they learned, and now advise for others, is to modify yoga routines for the kids so they can learn to stay focused. And, Anmol Mehta gives some specific timeline breakdowns for age-specific yoga classes here. As an extension of this benefit, the focus needed for Yoga can help kids learn to calm down. This can be through breathing exercises, or by learning to take time to ‘be still’ so as to reduce stress acquired during their busy and active days. 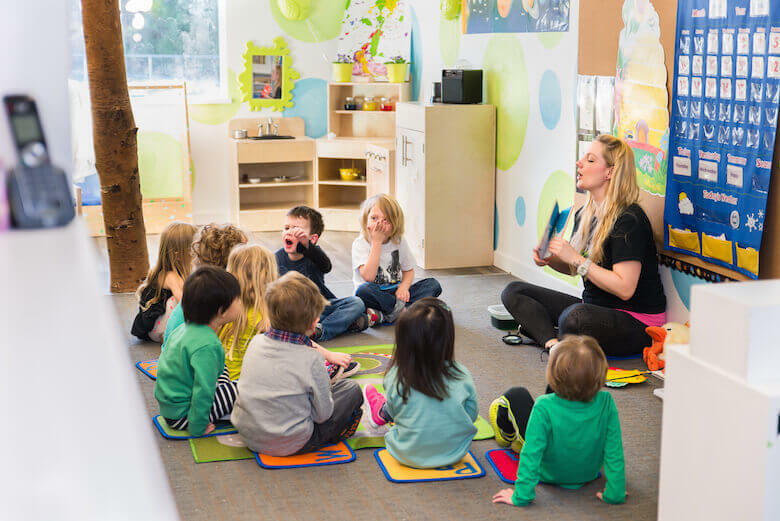 While this may not be a point a spiritual yoga instructor will emphasize as the number one benefit of teaching kids yoga, it is interesting from a preschool teacher’s perspective that there is a lot of role play in kid’s yoga. And certainly, articles online do bring it up. As parenting.com reports, some concern raised over the religious aspect of yoga has led children’s yoga teachers to veer away from Sanskrit names of poses (which, let’s face it, probably don’t mean much to kids at daycare anyway). Instead, they use names like, “cat, bridge, table, tree, downward-facing dog, volcano, and so forth.” This helps keep the focus on the physical benefits of yoga for children. And, we’ll dare to say, it makes it a tad bit more fun for the imagination and game-play when teaching yoga at daycare. The author also lists several poses, with photos, that kids love to do. And, a resource of very useful tips and safety practices for teaching kids yoga is also provided in linked-to articles on the post. And, this article says you can even get kids to dress up as characters while doing yoga, to make it even more fun with imaginative play. These are the types of imaginative preschool games we would play at daycare anyway. So the fact they can be combined with physical activity and other benefits of yoga is a win-win for early childhood educators. While it’s hard to pinpoint this down to a scientific ‘for sure’ statement, there is no doubt that physical activity and sensory development are important for kids (not to mention adults!). Plus, there are claimed health benefits of yoga for all ages. While some will argue that yoga helps boost confidence or that it relates to spiritual and mindfulness-related lessons, we understand that may not be the ‘hard science’ that some seek. And that’s ok! We do, however, consider the way that yoga challenges the body with stretching – that’s something that involves your muscles, which is the base of all flexibility and exercise principles. And the balancing acts are also helpful for kids. There are also claims yoga can help posture too. And let’s not forget the strength that can be built up with all exercise. Harvard’s medical school publication has written about these benefits of kids yoga, and more. Kids can get more out of yoga! We’ve only covered three benefits of yoga for children at daycare in this article. Whether for focus, imagination or physical benefits, yoga can be helpful for children of all ages. And, there’s more! Reading online can help you discover the added benefits of kids participating in yoga, which can include social skills and more of the ‘mindfulness’ help mentioned above. We encourage you to take a look, and discover how it can help your child specifically.